When Norman Xiong wrapped up his historic freshman season at the University of Oregon in May he had one goal for the summer: Make the Walker Cup squad. With his impressive summer, which included a win at the prestigious Western Amateur, Xiong did just that. The success, and victory, that followed at The Los Angeles CC this week was just icing on the cake. 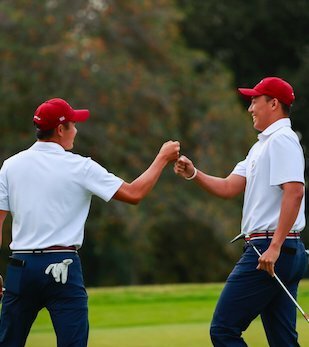 Teaming up with fellow SCGA member Collin Morikawa for both foursomes matches, Xiong would earn his first Walker Cup point in record fashion, taking care of business quickly in Saturday morning foursomes with an 8 and 7 victory. He would go on to win his Saturday singles match, his Sunday foursomes match and hang on to halve his Sunday singles match to go 3-0-1 in his Walker Cup debut. But teammate and Los Angeles native Morikawa would do Xiong one better, going undefeated and contributing four points to Team USA's lopsided victory. In addition to pairing with Xiong for two foursomes victories, Morikawa defeated Great Britain & Ireland's Paul McBride 3 and 2 Saturday and Harry Ellis 2 and 1 Sunday. Morikawa was one of three members of Team USA to go 4-0, the first time a team has had three members earn four points in the history of The Walker Cup Matches. "That first tee shot is something I'll never forget," said Morikawa, a junior at Cal and native of La Canada Flintridge. "To see all the people come out, you know they are rooting for you and Team USA, it's really something special. I was fortunate to have the Walker Cup here at home. Being from L.A., this city means so much to me. I heard little kids today saying they are from La Canada, which is amazing. I wouldn't want to be anywhere else to have this win with this team." And while Xiong, Morikawa and all members of Team USA were followed by large, supportive crowds all weekend, no gallery was as big or enthusiastic than that of The Los Angeles CC member Stewart Hagestad, who at 26 years old was the oldest player in the field. Hagestad, a native of Newport Beach who earned his spot on the Walker Cup team with a win at last year's U.S. Mid-Amateur Championship and low amateur honors at this year's Masters, had an unforgettable week playing in front of family and friends at his home club. "To have the final point to clinch the Walker Cup, on my home course, in front of all my friends and family, is pretty special," said Hagestad. "I think I'm going to have to take some time and sleep on this and let it marinate. But to do it in a team setting, to do it representing the United States, to do it with my friends and family almost having somewhat of a home course disadvantage by the amount of people and expectations that I put on myself, it's just so gratifying and I'm really, really proud of myself and I can't wait to celebrate with the guys tonight." Sitting out the morning foursomes matches, Hagestad was first out in the singles matches Sunday afternoon, a spot which proved to be important. After Team USA's Braden Thornberry took care of his match early on the 13th hole, and Xiong had clinched at least a half point by virtue of being 2 up with two holes to play, it was Hagestad's 2 and 1 victory over previously-undefeated Jack Singh Brar that officially guaranteed the home team the win. Hagestad learned of the victory-clinching moment from Shane Bacon live on FS1. "That honestly just gave me goosebumps," said Hagestad as he heard the news. "This is an incredible moment and now I just want to celebrate with the rest of my team." Overall, the three SCGA members on the Walker Cup squad contributed 8.5 points to Team USA, which won the 46th Walker Cup by a final score of 19-7. The Los Angeles CC's hosting of the Walker Cup marked the first time The Walker Cup Matches were held in Southern California. The Los Angeles CC will welcome the USGA back in six years, when it hosts the U.S. Open in 2023.